The Encounter Evening with Peter Robertson on October 20th 2013 was a precious time in God’s presence. Peter Robertson from Australia joined Ray Watson and the Encounter Team for an evening of intimate prophetic worship. The theme of grace and hope formed the focus for the evening as people experienced deep soaking worship. Peter Robertson started the evening with one of his songs titled “Let me know your grace”. This song opened the meeting and expressed our desire to the Lord to know Him more and His extravagant grace we are called to walk in. This song then provided the springboard from which free praise and other spontaneous songs developed. Throughout the evening people were encouraged to wander and look at the prophetic art displayed. Much of the prophetic art was around the theme of grace and hope and provided a form of ministry for people. People were free to express themselves in worship through any creative form, including prophetic art, dance, soaking and meditation. There was also an area for communion that allowed people to reflect and take communion either personally or as a group throughout the night. An aid for personal devotion and meditation was provided through a hand-out of scriptures based around the theme of hope and grace. These verses were also often used as the framework from which prophetic songs of the Lord were sung. The scriptures provided both Ray and Peter an outlet to explore creatively and prophetically the theme of grace and hope. A wide variety of prophetic songs on grace and hope were sung throughout the evening. Some were strong prophetic declarations, and others were more gentle and intimate soaking music. Interludes of instrumental music were sprinkled throughout. These instrumental sections provided people the opportunity for soaking and reflecting on the prophetic atmosphere created through the music. Near the end of the evening, Ray started the prophetic phrase “let’s hold on to our confession. Let’s hold on to our faith. He is faithful. He has promised.” This phrase was developed creatively by the musicians and built to a strong declaration of our faith and trust being placed securely in Him. The evening ended with a moment of stillness in His Presence as Peter gently played on his guitar providing an intimate place of encounter for people. The meeting then closed with both Peter and Ray giving a brief exhortation and providing an opportunity for people to receive ministry. Join Ray Watson, Terence Smith and our special guest Peter Robertson on October 20th 2013 for Encounter Evening. Come experience deep, intimate worship and encounter with God. We are excited for this upcoming Encounter Evening and look forward to this special time of experiencing His Presence through worship. Terence Smith (a regular member of the Pursuit Encounter Team) brings his own wonderfully eclectic style of guitar playing into the musical mix. He is not just a creative guitarist but an anointed worshipper with a sensitivity to the moving of the Holy Spirit. Peter Robertson is a musician and itinerant minister from Australia. Ray and Peter have been friends and fellow musicians together for many years. He is also an integral part of the music of The Secret Place by providing all the guitar work on The Secret Place albums. Peter also produces his own soaking music that is available for download at our online store. Together, Peter and Ray bring a unique blend of anointings, musicianship and worship style. On October 20th, 2013, we have the privilege of hosting Peter at our monthly Encounter Evening. This is a night not to be missed as Peter and the Encounter Team come together to pursue His Presence and facilitate a time of intimate soaking worship. We look forward to the prophetic fusion all these gifted musicians will bring to our next Encounter Evening! "I have personally enjoyed listening to Peter's music... I have no doubt that you will experience the gentle refreshing of the Holy Spirit as you allow Peter's music to wash over you." - Joseph Prince, Senior Pastor, New Creation Church, Singapore. Download our information brochure for more information about Encounter Evenings. The brochure is in pdf format and is perfect for inviting others to come experience a fresh encounter in His Presence. Are you looking for a church in Auckland? Visiting from out of town? Coming from overseas? 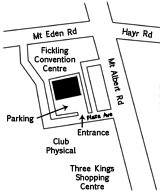 We are located in central Auckland City in the Fickling Centre - next to the 3 Kings Shopping Centre, with lots of parking. Click here for a larger map and driving directions. We are a Christian church licensed through ICFM (International Convention of Faith Ministries) and are part of Global Legacy from Bethel Church in Redding. Experience deep encounter with God through the music of The Secret Place. This music is perfect for healing rooms, prayer rooms and your own personal soaking time with God. Bible verses sung to music. We respect your right to privacy and value your trust. Your email address is kept strictly confidential and is not shared with any other person or company for any other purpose. We do not spam. You may unsubscribe at any time.